"There can be no separation of the Mind and the Body, they are one ! This is the greatest gift to our 'Humanity'... Nourish both, and grow and prosper exponentially." Dr. Craig Brown is an Inspiration to any Physician who seeks to heal, and expand their wealth of knowledge mind, body, and spirit. He has changed lives locally, nationally and has a wealth of wisdom to share. I would not hesitate to recommend his works in Holistic treatment as the only way to sustain health for our patients and ourselves. I was given the opportunity of speaking to Dr. Brown about my son who is on a ventilator fighting for his life. As a mother, you will go to all extremes to find anyway to keep your child alive. Hence was brought to Dr Brown.With no hesitation ,he took me immediately knowing the severity of my sons condition.We had a thorough conversation about my son's condition and found his sound advice genuinely sincere and helpful. Although there is no cure for my son ,Dr Brown's suggestions can help boost his immune system to help him fight is fight longer until doctors find a way to keep him alive. I believe in your method and your mission. Your dedication and passion to educating people for the greater good ,will lead all towards a healthier nation. We have started a 501(c)3 foundation for my son and well as other sick children in need. Website will be up in the next few days. Dr-Craig Brown is definitely an authority on the subject and I'm sure he can help us weave thru the contradictions. It has been a year since I made the complete lifestyle change after suffering for many years with PMDD, dysmenorrhea, acne, psoriasis, multiple food allergies and a "new" autoimmune disorder. After experiencing many juice cleanses, 'holistic" retreats and regiments, I can attest that Dr Craig Brown's program is the most complete. I have never felt more alive and grounded. My head no longer feels like it is in a fog, I am thinking more clearly and definitely more grounded emotionally- referring to the PMS or PMDD, my periods are not as painful nor are they as heavy. Not to mention that people are constantly remarking on how much I glow. Dr. Craig Brown is a trusted friend and colleague. He cares about people. His integrity and his deep knowledge carries Holistic and Alternative Medicine to a new level called "Expansive Holistic Health"
My name is Debra Cornell. I am a Board Certified Holistic Health Practitioner, NASM Certified Personal Trainer, Certified Raw Foods Chef and Instructor, and extremely grateful and proud to become a Certified Expansive Holistic Health Health Educator. For the last 5 years I have been on a journey to gain as much knowledge and information as possible on health and wellness so that I can share and teach others in the most optimal way. From the very beginning I have been blessed to learn from some of the very best educators in the country, but it wasn’t until crossing paths with Dr. Craig Brown that brought it all together, and took my education to an entirely different level. 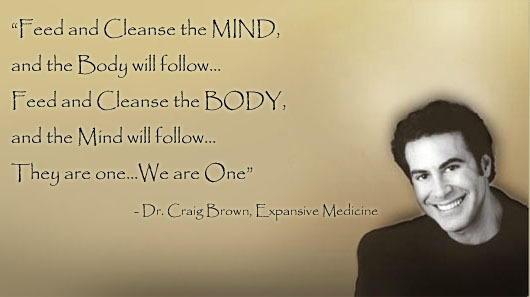 Dr. Craig Brown graciously took me under his wing and taught me the healing protocols of Expansive Holistic Health. He has brought about major shifts and changes in my own life with several health issues I had been unsuccessfully dealing with on my own. Thru his teachings and following his protocols, I am happy to report how much better I feel in every area of my life. Physically, mentally, and emotionally…body, mind and spirit. Dr. Brown is truly coming from the heart with his passion to help others with prevention and reversal of disease as well as slowing down the aging process. He is the answer that we have been searching for! While working with him side by side for six months, I personally saw his level of dedication and commitment to make an explosive change in our world ravaged by illness and disease. Dedicating his life to making monumental changes, he has worked tirelessly and fiercely to bring forth his message of Expansive Holistic Health that will revolutionize the world and the way we think about “Wellness”. Thank you Dr. Craig Brown for your treasured friendship, for all that you’ve taught me and for your ongoing encouragement and support!!! Because of you, I can be a better me! Because of you, the world can be a better, healthier and happier world! You are a brilliant, bright light that the world has blessed with and to show us the way to be the best we can be!!! Have you set a Health & Wellness Goal for 2013? Mine is to juice daily and incorporate yoga / meditation into my life more consistently every week. I am on a path to improve my health every day. What if you could have ONE resource that you could rely on? Dr. Craig Brown with is truly the expert and a trusted authority you can count on to improve your health the natural way. You can listen to his Blog Talk Radio Show Radio at www.BlogTalk www.blogtalkradio.com/expansivemedicine (5 shows available) to learn more. Dr Craig Brown and I have been friends since professional school. I am avid cyclist and my performance has not been improving over the last year even after hiring a trainer specializing in this field. I called Craig and told him my dilemma, knowing his Expansive Holistic Health program. OMG following his prescription within two months my times improved! I feel younger and my wife, well I can't tell you what she really says, but it's all good. lol Again, thank you so much my friend. Working out is what makes my life work out for me, but after many years of training I wasn't getting the results I wanted. Then my life changed when I was introduced to Dr-Craig Brown and learned about my physical, mental and nutritional strength. The words, which he never let me forget was "staying forever young". As I approached my 50's, I reached for my Bucket List, and made a commitment to do my first Bodybuilding competition before the big 50! So at 48, I connected with Dr Craig Brown, and asked him to be my Guru. He carefully designed a program that began with a weekly workouts , gradually increasing the heaviness of my weights, in addition to a nutrition program, and provided the path not only for my goals of sculpturing my body, but gave me a life-long fountain of youth and energy, effervescence, and amazing physical and mental stamina. Dr Craig Brown has given me the results, and proof that the commitment to this program of Mind and Body are the remedies for America's current epidemic of obesity, physical stagnation, and emotional ennui. Dr Craig, has changed my life, and there is not a week that goes by that I don't reach out for advise, from sleeping, healing, nutrition, and overall health, he is my Guru. I am forever indebted to this man. Thank you Dr Craig for being apart of my life and keeping me "Forever Young". Words cannot express my gratitude for all the help and advice you have given me. Your wisdom has changed my life and my health. After ten years of searching for answers, it was a holistic nutritionist who found my celiac disease. Ten years and two autoimmune diseases later, I was blessed to meet you at Whole Foods. I remember laughing because your cart was full to the brim with vegetables! Little did I know then that you would introduce me to a cure for all that ailed me. For ten years I suffered with chronic IBS, reflux, recurrent rashes, joint and muscle aches, vision problems, memory loss, foggy thinking, tinnitus, chronic fatigue and insomnia. I couldn’t believe how old I felt at 40. I lived in Boston and had been to so many doctors, the best of the best, and all they wanted to do was label me and prescribe medicine. I tried to follow their advice, but I soon realized there seemed to be worse side effects to the medicine than to the disease, not to mention they did not help! I started to lose hope, became depressed, and turned to God for help. I was so desperate that I found myself praying for hours every day. After only two weeks of following just the first few steps of your program, I felt the chronic pain in my joints and muscles lifting and my rashes disappeared. The only way I can describe it is that it felt like the pressure inside was being relieved, deflated. Everything in my body started to heal. Now, three months later, I am so pleased to tell you that I am completely pain free! I am 100% symptom free and feel myself improving every day. My focus went from foggy and forgetful to razor sharp, alert and present. My energy went from chronic fatigue to high energy, non-stop go! Not to mention the changes I experienced in the bathroom… a new normal. Each time I reach out to you, I come away feeling enriched from the depth of your wealth of knowledge and so touched by your genuine concern. You have been so generous with your time and astute with your knowledge and I am forever grateful to you. Because of you I feel like I have my life back and I am LOVING it!!! Please let me know when you are speaking next as I wouldn’t miss it for the world! Today I am feeling so much better! Thank you for your advice! I drank the distiller water w/lemon and also used a neti pot to flush my sinuses. I feel a little pressure in my head when I stand up, but that's it! I was actually able to eat a small meal and go to work today. I will definitely be checking out your conferences and books. Thanks again! Tomorrow will be one week that I decided to change my life. I was headed to what a typical person would do, go see a doctor. Because of stomach issues & REALLY not feeling well my dear friend Dorit Papelbaum told me to get in touch with Craig Brown. Instead of having tests run and being on all kind of medications with side effects I called Dr Brown to seek alternative help. Not only was he so kind to speak to me but he spoke to me for an hour and 1/2. He knew exactly what was going on and how to treat it. He shared so many incites to how the body works and how FOOD affects it all. I knew I hadn't been treating my body well with what I was putting in it. Dr. Brown told me what to get and what to eat. It was a HUGE change but the most important this is if I stick to it, I would feel better. THANK YOU Dr. Brown from the bottom of my heart for helping me not only with my stomach issues but for educating me and getting me so exited about my healthy future. I haven't met a fruit or veggie that I didn't like so raw is working out for me. Instead of grabbing some carb, processed, salted "nosh"or meal, I now grab FRESH REAL SPROUTED SWEET YUMMY veggies & fruits. I'm a work in progress, but the future is LOOKIN GOOD! If you want to TRANSFORM your health, feel AMAZING from the inside out and be filled with ABUNDANT ENERGY then you want to connect with Dr. Craig Brown (Founder of "Expansion Medicine")!! He is a raw living food genius (with recipes that are the best I have ever tasted), whole body, mind, & spirit healer (the real deal that is SCIENCE & SPIRITUALLY based) and powerful global health advocate (committing his entire life to making a significant DIFFERENCE in the world). There are only a few people that you meet throughout your life that change the way you look at the world and Dr. Craig Brown has been one of them for me. He embodies what he teaches to levels that I rarely see in the medical or spiritual communities (he actually walks the talk). I highly recommend Dr. Brown's programs, protocols, and teachings. Dr. Craig Brown is the most unique individual that I have ever met. He has devoted his life to a quality of life that he wants and shares withr all of us. He has studied, tested and proven this brand new science called Expansive Holistic Health. As a man of integrity his dream is for each and every person to be well amd be able to share their 'wellness and happiness' with their loved ones...and the world. I have started to follow Expansive Holistic Health over the last few months and have already noticed major changes in my focus and energy which has allowed me to accomplish things in my day to day life that I couldn't do or even would attempt to do before. I just wanted to send much appreciation to you for helping me recently with a health issue I was having. Your protocol helped me within 3 days of starting..I know you are the real deal as you have tested all you do yourself and know it works..There are a lot of people out there that I view that do not understand how to detox and the methods you need to stay healthy while doing it..I so look forward to your protocols coming out soon as I will highly recommend them to everyone I know..Again, thanks..In health and peace and with much appreciation, Diane. "Dr Craig Brown has given many valuable years of his life in seeking answers and solutions to how we can best mange our health. He has the extensive knowledge in both mainstream and holistic medicine to sift out the good from the bad and combine the two approaches for maximal effect. His goal is to allow peoples of all ages and walks of life to sustain a healthy and fulfilling life,free from the harms of a poor diet and unnecessary medications with their negative side effects. He has proven to family,friends and colleagues alike,the powerful benefits of his well researched protocols,which enhance longevity and overall well-being." SIMPLY THE BEST !!!! Want to feel healthier than you ever have ? More energized, alive & grounded ? It's simple, check out the healing protocols of Expansive Holistic Health with Dr. Craig Brown and allow him to bring you into perfect health the natural way. He is an amazing person, humanitarian, health expert, doctor, spiritualist & authority figure with an extreme passion to help others through his preventative & disease reversal techniques. I've tried, tested & researched a lot in the natural health field & his systems & products are by far the best in class. Try them, you won't regret it, what better to invest in than the best YOU there can be. Especially his meditation downloads, on the first try they literally give you energy , clarity, power, peaceful sleep & can renew & rejuvenate every cell in your body. Happy body & mind ='s Happy life !!! Deserved by everyone! Dentsply North America/ Dental Consultant M.B.A. I can't wait till my next session... l so didn't want to end. It really was absolutely amazing feeling... i noticed at some point that your voice became distant as if you were softly in the back ground or deep in the depths of my mind. .. your brilliant, I thank you for taking me there. The thought of going deeper... exhilarates me! I was having trouble sleeping at night with such a busy schedule during the day... I had tried everything, from walks to meditation to natural herbal teas. Nothing was working. I decided to download Dr-Craig Brown's meditation... I found it very hypnotic and was out in the first ten minutes of using. I continually use your meditation download when ever I can't fall asleep from the moment my head hits the pillow... it works every time. It also works during the day for a great energy boost. ~ Powerful for certain! Along with Oooh La La, ~forget coffee... and I have all the energy during my day for work... family.. and a health routine~ Highly recommended.!! !